I don't know about you but I am obsessed with a good garage sale. Yup, I admit it, finding a yard sale, flea market or estate sale is quite possibly my favourite thing to do on the weekend. In fact I used to coerce my family into having the occasional yard and we'd all sit in the drive way, turning trash into treasure. Sadly they don't seem to be as popular here in Australia which is quite a shame but then I saw this link on Jason Grant's blog and well...you know where I'll be this Sunday. I am so going to that! And WILL be dragging the husband along too!!! Or maybe.... A good friend! This would be right up her alley! I need to fly up to Sydney just for the day! 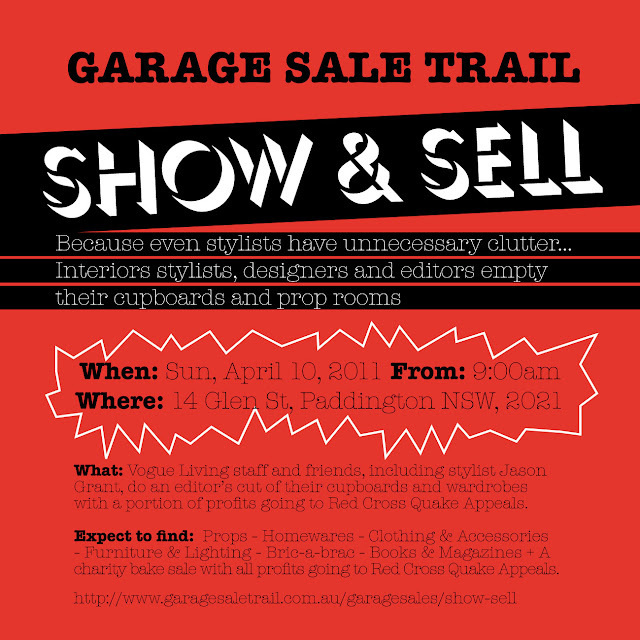 What a garage sale this will be! You inherited the estate sale/yard sale gene from us!!! We go to them every saturday when we're on Cape Cod and we've gotten some amazing things and seen some amazing homes! We had fun doing our yard sales didn't we Jaclyn! I so wished I lived in Sydney - cant wait to see what fantastic purchases you get! !